A one-day trip to two enchanting cities! A fully equipped coach will take you from Barcelona to two great towns in the North of Catalonia, Girona and Figueres. Girona, home to one of Europe's best-preserved Jewish quarters, has all the charm of a large city but without the crowds. In Figueres, the birthplace of famous artist Salvador Dalí, you can enjoy the special Art in Teatre-Museu Dalí and "Dalí Joies". A Guide will travel on board during this trip. A one-day trip from Barcelona, stopping first in Girona. A city that invites you to lose yourself in its streets and walk through the old town in one of the country’s finest historic ensembles: medieval walls, Romanesque and Gothic landmarks, baroque buildings and one of the best-preserved Jewish quarters in Europe. The second stop is Figueres, city of Dalí. A very attractive town with mansions, shops and pavement cafés… and with the Teatre Museu Dalí as its main highlight. The museum allows you to explore the surrealist world of Salvador Dalí. Itinerary: Barcelona - Girona - Figueres - Barcelona. • Guided tour of Girona. • Orientation tour to the Dali Museum. • Complete informative guide with detailed information about Dañí. Figueres, Girona and the places to visit. • Arrival back in Barcelona at 7.30pm (Plaça Catalunya). 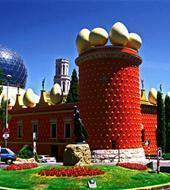 • Free admission to the Teatre-Museu Dalí and "Dalí Joies" in Figueres. • Discounts at museums, places of interest, shops and restaurants. • Languages: Catalan, Spanish and English. • Audioguide system in 10 languages for sale on board: Catalan, Spanish, English, French, German, Italian, Japanese, Chinese, Portuguese and Russian. The same audioguide system is valid for all three routes and has an extra charge of 5€. This tour is leaving from Plaça Catalunya, Barcelona (in front of El Corte Inglés).